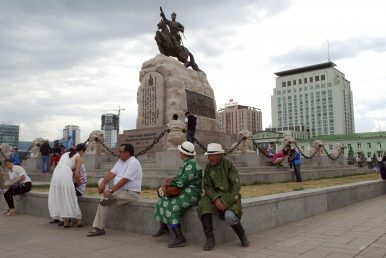 People sit near a statue of Sukhbaatar, one of the founders of the Mongolian People's Party (MPP), at a square in Ulaanbaatar, Mongolia, (June 30, 2016). The public will be watching the Khurelsukh government for its reaction to massive allegations of misuse at the SME Fund. Political frustration has been building in democratic Mongolia for several years now as allegations of corruption have become a drag on policy decisions. Last week, another corruption scandal broke and is now engulfing nearly all of the political leadership. Could this be the scandal that brings Mongolians onto the streets to bring about a major shift in political culture? In 2009, the Mongolian government expanded the Small and Medium Enterprises Development Fund (Жижиг, дунд үйлдвэрийг хөгжүүлэх сан, often abbreviated as Ждүхс or Ждү) to support small- and medium-sized enterprises (SME). This was a moment just before the boom years associated with the initial construction at the giant Oyu Tolgoi copper mine, which saw Mongolia attain the highest rate of growth in the world in 2011. The fund provided companies with low-interest loans at 3 percent interest up to five years and 2 billion Mongolian tugrik (roughly $780,000 at today’s exchange rate). The Fund is reported to have dispersed loans totaling nearly 700 billion tugrik, amounting to several hundred million U.S. dollars. The fund was created in and continues to be overseen by the now-Ministry of Food, Agriculture, and Light Industry. As it has emerged, oversight was lax. Investigative journalists, especially Ch Bolortuya and her colleagues at Ikon.mn, have been essential in bringing the abuse of the SME Fund to light. Many of the companies that received loans are tied to prominent politicians through ownership of the SMEs that benefited. Journalists and some civil society activists, most notably B Otgontugs, an education economist and professor at the National University of Mongolia, have been relying on leaked lists of loan recipients and then comparing those to ownership records for these companies to identify politicians that have benefited from loans. So far, no one has disputed the leaked lists, suggesting that they are genuine. The investigations into these entanglements of politicians have been very public and careful. This contrasts sharply with past practice, where finger-pointing has produced a perception of pervasive political corruption, but few prosecutions. The current investigations have already led the current minister of food, agriculture, and light industry, B Batzorig, a member of parliament for the Mongolian People’s Party (MPP), to offer his resignation. The chief prosecutor has requested parliament to revoke Batzorig’s parliamentary immunity. So far, protests have primarily occurred on social media, especially Twitter. Mongolians are avid social media users as was shown in the rapid mobilization when a Turkish educator was threatened to be abducted by alleged Turkish security agents in July. Even more than in that mobilization, this past week Mongolians have been rallying around Twitter hashtags like #Ждү to voice their frustrations. So far, however, few protests have materialized on the streets, although they have been announced for the coming weekend. Whether outrage will lead to demonstrations or even large-scale protests will depend on the government’s reactions to the allegations. While most of those implicated are members in the MPP’s parliamentary supermajority, MPP Prime Minister U Khurelsukh has not been implicated. His reaction will be closely watched for whether he will initiate genuine investigations that might lead to prosecutions or will try to downplay his party’s entanglement. Speaker of parliament M Enkhbold is not directly mentioned in SME Fund publications so far, even though his involvement in the apparent auctioning of state offices in a disputed 2016 whistleblower video robs him of much legitimacy in accusing others of corruption. President Battulga’s family also appears to be implicated. It is not only political frustration that is in the air, but also constitutional change. There has long been a sense that the division of powers between the president and parliament, as well as the prime minister, has not been clear enough. In a potentially volatile situation, such discussions might turn into an argument for authoritarian rule, a soft coup of sorts. However, none of the suspects for such an attempted grab for power, most prominently Battulga, has much credibility in the current context. If the reaction to allegations by the Khurelsukh government is seen as wanting by many protesters, anger might quickly turn at parliament, with demands for resignations. In a small population, many urban professionals will have acquaintances who applied for support from the SME Fund but were denied, which will lend urgency to protests. Professor Otgontugs indicated in an online interview that there are “28 special funds like the SME Fund” suggesting that more evidence of malfeasance is yet to come. Whether new political forces that are more devoted to a fight against corruption than the current political duopoloy of the MPP and the Democratic Party would emerge from new elections is not clear. It does seem likely, however, that attention to evidence will fuel distrust of political parties further and will ultimately lead to upheavals in democratic Mongolia. Dr. Julian Dierkes is an associate professor at the University of British Columbia (UBC) in Vancouver, Canada where he teaches in the Master of Public Policy and Global Affairs. He and Mendee blog at http://blogs.ubc.ca/mongolia. Follow him on Twitter @jdierkes. Mendee Jargalsaikhan is a Ph.D. candidate in Political Science at the University of British Columbia. His dissertation examines the development of Mongolia’s democracy. Follow him @MendeeJ. The parliamentary speaker has been forced out, the latest twist in Mongolia's long-simmering political scandals.